I first came across this relatively prolific (this is his 7th studio album since 2002's To Let – not counting two live albums, that means he comes with a new album every two years) Australian singer/ songwriter/ multi-instrumentalist “World Music” artist thanks to his previous album Koonyun Sun, which was released through the elitist Anti- label (review posted...somewhere in April 2010, I guess – I am quite unable to check that at the time of writing, and forgot to do so when I would've been able to). As I am sure I mentioned in that review, Rudd is a fearless composer, not afraid to mix forest noises and ethnic stuff in his music. The occasional use of didgeridoo is not alien to him, and neither is the use of what sounds like African rhythms and vocals (besides Aboriginal, of course). He also has a very unique voice, and when you hear him play with just the acoustic guitar, you might swear he's kindred to Paul Simon (whom, let's not forget, also is a great World Music artist). There's plenty of singing from outsider singers as well, occasionally resulting in what sounds like crowd chants. The songs in which the guitar is electrically enhanced finds Rudd play rhythmically hypnotic tunes (check out what he does on “Bow Down”) with an occasional psychedelic vibe. 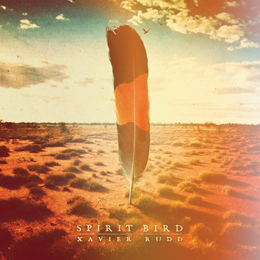 In essence, Xavier Rudd is a unique musician and composer, and his albums are móre than a welcome change from the usual music thrown into my to-do box. Personally, I even prefer it above everything else. Sure, it's no Metal...it ain't even “Rock” for a great part...it's just Folk music with occasional ethnic flavouring, occasionally with Dub sensitivities, but the music is simply so overwhelmingly warm and down to earth. Aha...good one, that! It brings me back to a sentence in the first paragraph of the info sheet that accompanied the promo download of the album : “...For singer/ songwriter/ multi-instrumentalist Xavier Rudd, connecting land and heart isn't a matter of conscious art but a humble understanding that everything before us will remain long after we are gone...”. Well, it's safe to say that Rudd puts his heart quite expertly into his music. If you cannot hear that, then you don't understand good music (detached from genre constrictions) for what it is! Oh, and 4 decades after John Lennon's “Imagine” (which was written to bring peace among people), Rudd comes along with the ultimate Peace Folk song “Creating A Dream”...the album closing track which goes just a little further, asking also for peace for the earth, which has been raped over and over by industries. (...sigh...) Creating a dream (...sigh...). Yeah, my absolute top album of 2012! Yeah, my absolute top album of 2012!